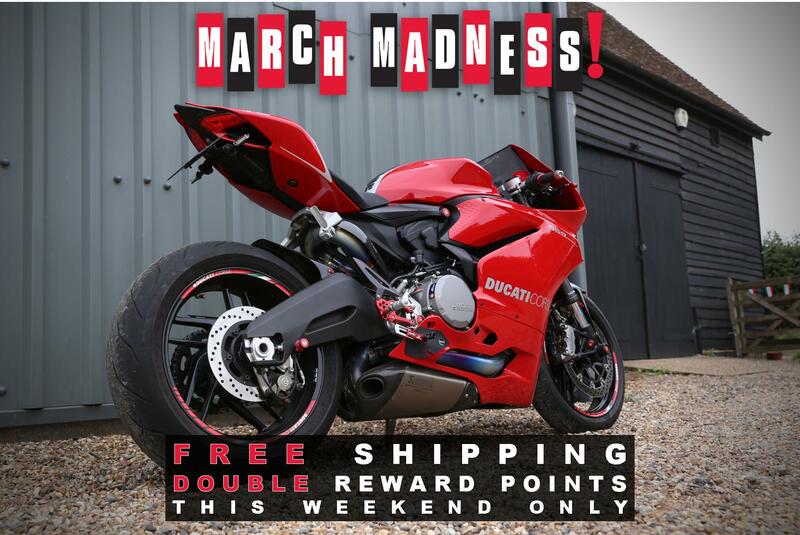 MVAgusta.net > Marketplace > DesignCorse > March Madness Promo | Free Shipping* & Double Reward Points! March Madness Promo | Free Shipping* & Double Reward Points! Alright, we're probably not thinking straight due to how ecstatic we are about the riding season start being pretty much round the corner, (hello sun, where are you?). Anyway this weekend we're going to reflect some of our madness on to our online store: For all purchases until Monday 7am UK time only we will include FREE SHIPPING* & DOUBLE REWARD POINTS! Please find terms and conditions to this madness below. FREE SHIPPING CODE WON'T WORK FOR ORDERS CONTAINING PADDOCK STANDS, FRAME SLIDERS AND ORDERS WITH SHIPPING COSTS HIGHER THAN £50. ALL OTHER DISCOUNT CODES, REWARDS ETC MAY NOT BE USED FOR THE DURATION OF THE SALE.